21Nova Casino is definitely worth whiling away the time exploring – you will build up your stature in the Club 21 loyalty rewards scheme and there are a variety of progressive jackpots for you to join and potentially win. I suggest muting the music and putting on your favourite playlist to help you concentrate on 21Nova Casino’s big prizes! 21Nova Casino has been around since 2012 and their logos are registered trademarks of the William Hill Organisation. 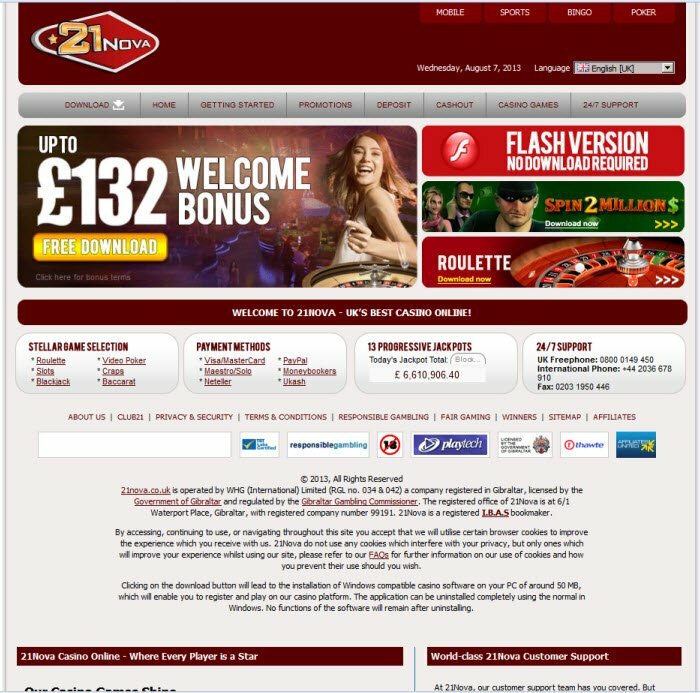 They boast customer care and assistance second to none and, a variety of online casino payment methods. 21Nova Casino - A Real Novelty? Using Playtech software, this casino is exponentially fast and easy to download. 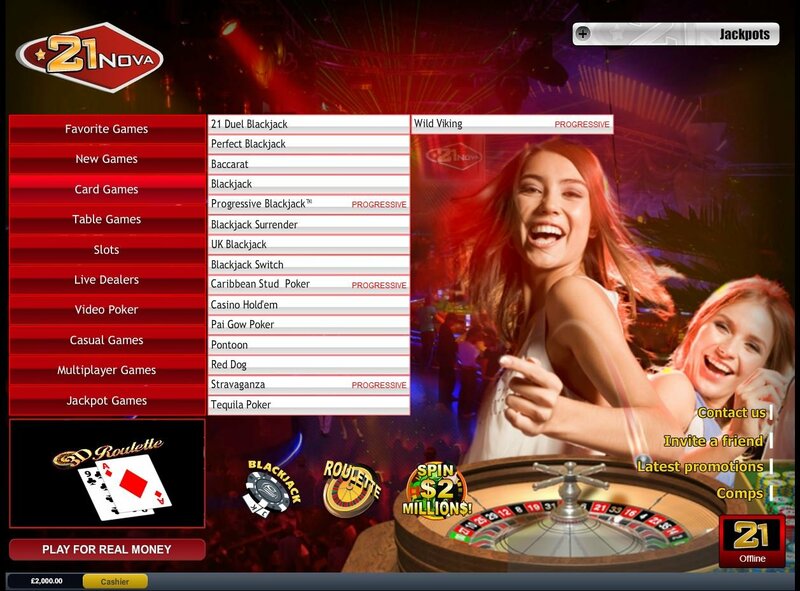 21Nova Casino software has a good amount of video slots and also boasts some of the classics. There is nearly every type of table game you can imagine and, the variation of the usual suspects is, quite simply, astonishing. 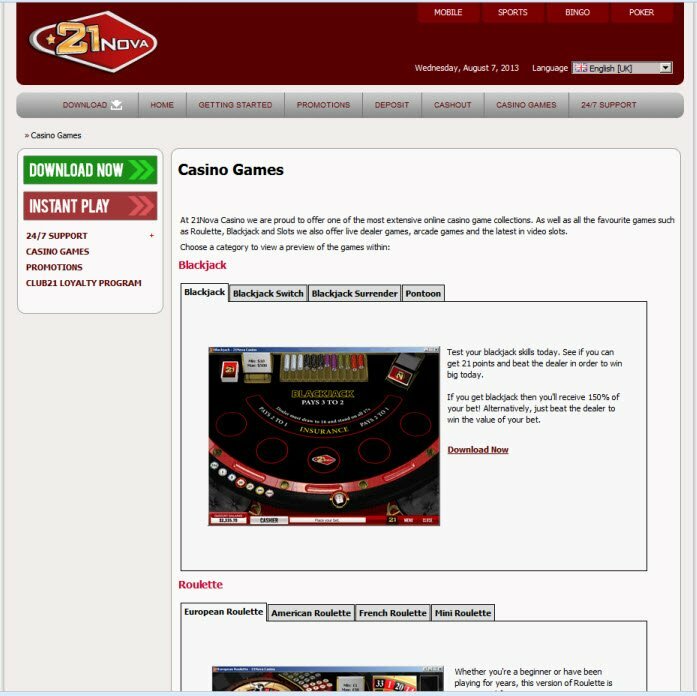 It is however, irksome that you need to download each game, despite download taking less than 10 seconds on a good internet speed, those of us that occasionally suffer with low bandwidth will rue the day we download 21Nova Casino. That and the pop-up windows telling you that you have been idle too long (excuse me, I’m quite entitled to an impromptu loo-break in the middle of a game) are quite an annoyance and set my teeth on edge. 21Nova Casino makes up for this with quite an important highlight for its players, as you will discover below. It is however, irksome that you need to download each game, despite download taking less than 10 seconds on a good internet speed, those of us that occasionally suffer with low bandwidth will rue the day we downloaded 21Nova Casino. The interface is nifty and makes short work of navigating an eclectic lot of games on offer. A complimentary points system puts you up there with the big rollers (or optimises your roll if it’s a big one). You are automatically enrolled and earn points for every bet wagered, win OR lose. The more you play, the higher your level of VIP status and the more points you are awarded for the same bet. These points can be accumulated and turned into real cash to play with. 21Nova Casino’s graphics are really nothing to write home about but, in a spectacular twist, our beloved casino elevator music is spruced up for the Scratch Card’s, and is positively engaging. A rather neat trick is the 21Nova Casino’s way of stopping the music whenever the casino window is minimised. This is an absolute god-send when an email with video attachment comes through and means I don’t have to fiddle around trying to find a mute button. The classic fruit machine in the arcade games section is refreshing to see and soothing to my eyes after the poor graphics of other, more adventurous 21Nova Casino games and slots. From the user interface itself, it is very easy to navigate your way to the sort of game you are looking for. Whether it is a 21Nova Casino progressive slot or one of their newer games, you can easily pick the games that will make you the most money right from the off. Playtech bonus opportunities and jackpot results are some of the highest in the industry and, this makes for an exciting 21Nova Casino play time indeed. The 13 progressive jackpot features are, quite simply, nail biting and, definitely worth joining in on - as 21 Nova Casino says, you have to be in it to win it!